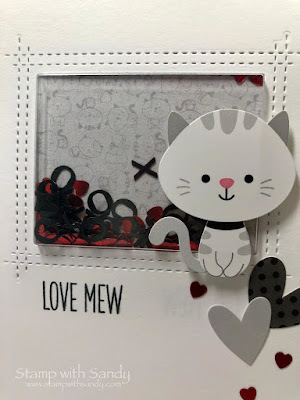 Hello, friends :) I have a fun little shaker card today, featuring one of my most favorite subjects, kitties! 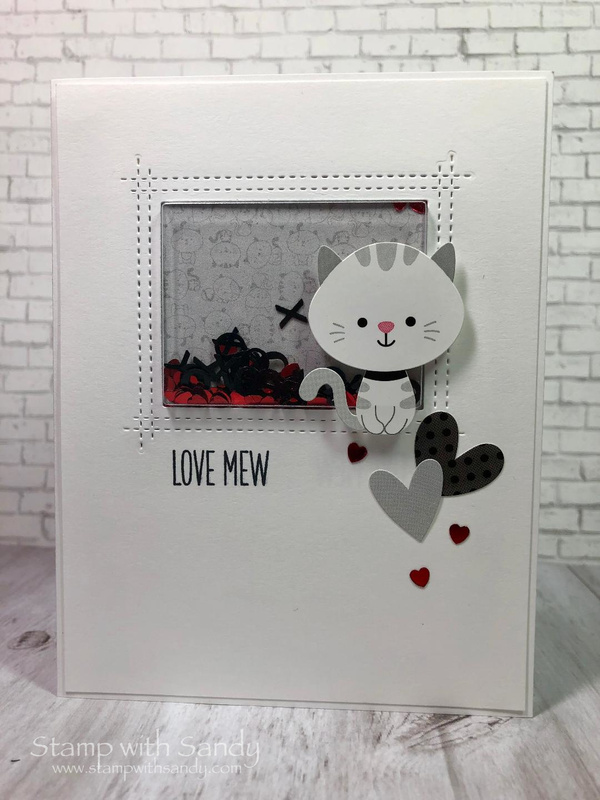 This was a simple project, thanks to a fun-to-use shaker pouch, a coordinating window die and some super cute stickers from Doodlebug. If you look closely, you'll see that the background paper has some cute tone-on-tone kitties, too. The shaker ingredients all came from the dollar spot at Target. I'm playing along with the Simon Says Stamp Wednesday Challenge, which is Have a Heart. They'd like to see products by My Favorite Things, if you have them. My sentiment, the shaker pouches and window die are all from MFT. 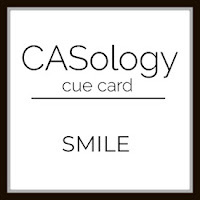 The cue card at CASology is Smile, and I think my smiling little kitty fits the bill. 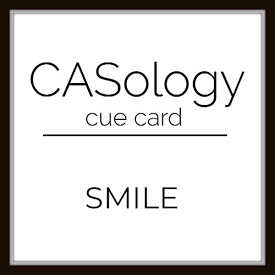 Normally I wouldn't consider a shaker card to be CAS, but I think this one has plenty of white space, and thanks to the stickers it came together in a flash. Here's my card inside and envelope, with a few more stickers. OMG! This is so cute! Thank you for sharing it! How ingenious! Adore the xoxos! You got me at the title too. Love the color combo, perfect! This is such a cute shaker Sandy! Isn't it fun to stop and see what the dollar bins have at Target! So happy I stopped by! Oh my this absolutely soooo cute. fab shaker card. SO cute!! 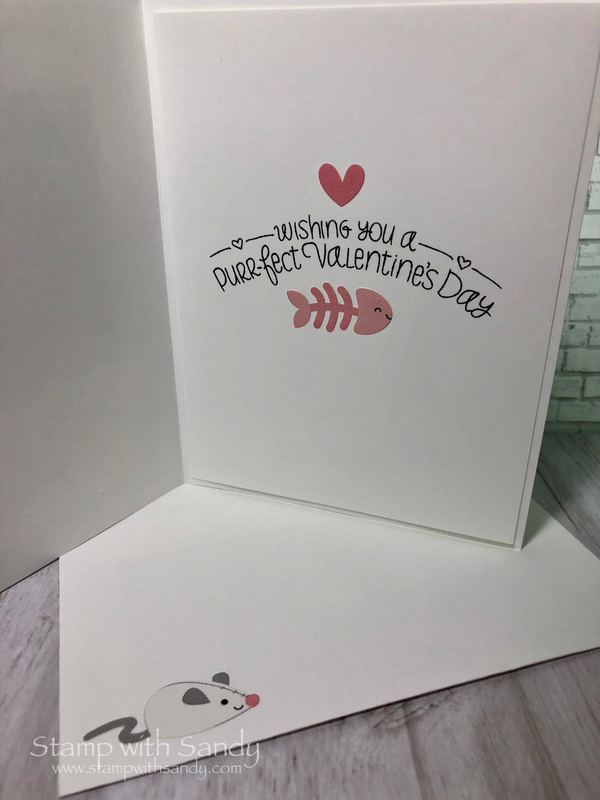 And the inside is just perfect!